Grand Canyon South Rim – October 2010 Have you ever wondered what our Earth would look like if you could travel back in time? A walk along an extraordinary new exhibit in Grand Canyon National Park gives you a great opportunity to do just that, from a geologic point of view. —–Formally opened in October 2010, the Trail of Time is an interpretive walking timeline that focuses on Grand Canyon vistas and rock formations and invites visitors to ponder, explore, and understand the magnitude of geologic time and the stories encoded by rock layers and landscapes. —–The 4.56 km (2.83 mile) walk follows an existing paved rim trail on the South Rim of Grand Canyon between Yavapai Observation Station and Grand Canyon Village. Each meter you walk is noted by a brass marker, representing one million years of time. 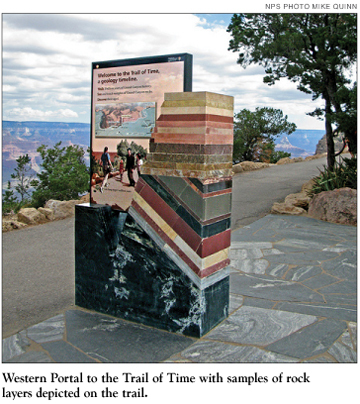 Viewing tubes and other interpretive features help visitors connect the rocks visible in Grand Canyon to their place along this geologic timeline. —–The Trail of Time is part of a research program in informal science education aimed at understanding and improving public understanding of geologic time—the connection between human time scales and the million year heartbeat of the Earth. Developed through a partnership between Grand Canyon National Park and the University of New Mexico, the project was funded with a $2 million grant provided by the National Science Foundation. Dr. Karl E. Karlstrom, a Geology Professor at the University of New Mexico, led a team comprised of interpretive specialists from the National Park Service and academics from Arizona State University and the University of Massachusetts in the design and development of the exhibit. —–Click here for an informative writeup and photos on opening day events of the Trail of Time by geologist and lecturer Wayne Ranney. Albuquerque – December 23, 2010 The U.S. Environmental Protection Agency has proposed new regulations aiming to reduce haze in the scenic vistas of national parks throughout the Southwest. The new rule would help control excess pollution caused most specifically by the coal-fired San Juan Generating Station, near Farmington, New Mexico. —–The National Park Service and other groups contend that Utah’s Arches National Park and Canyonlands National Park suffer from haze-causing emissions generated by coal-fired plants in New Mexico, specifically the San Juan facility whose four units collectively emit enough pollution to impact visibility at 16 nearby national parks, monuments and wilderness areas. ——If adopted, the new rule would require owners of the San Juan station to install selective catalytic reduction, a pollution control technology that would cut the nitrogen oxide emissions at the plant and reduce haze by 80%. As a result of a lawsuit filed by the National Park Conservation Association in 2008, the EPA must finalize a regional haze cleanup plan for nearly all states by January 15, 2011. The Mike O’Callaghan-Pat Tillman Memorial Bridge, at 1,900 feet, is the longest single-span concrete arch bridge in the western hemisphere, and it’s been working well since its official opening on October 20, 2010. 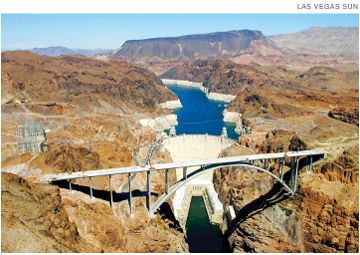 Designed to accommodate more than 17,000 cars and trucks per day on the new four lane bridge bypassing the former route across Hoover Dam, it is doing just that. Theoretically, the new route was supposed to shorten travel time for commercial shippers along the Southwest’s major trade corridor by reducing the traffic congestion that used to create mile-long bottlenecks on U.S. 93, the two-lane highway across Hoover Dam. —–Now, however, severe traffic congestion created by hundreds of vehicles spilling off a four lane highway onto two-lane routes through the quiet residential community of Boulder City, Nevada, has affected businesses, impeded emergency services and frustrated residents. It’s even forced some local motorists to convert bike paths into makeshift roads just to get around, according to Adrienne Packer, writing in the Las Vegas Review Journal. —–Discussions continue about how to handle the situation until the problem can be solved, either through widening portions of the existing highway or following through on construction of a Boulder City bypass originally selected in December 2005, but never implemented. —–Travelers en route to a river trip through Boulder City should remain aware of the problem. Since Spring 2006 the original Quarry Visitor Center at Dinosaur National Park near Vernal, Utah, has been closed due to structural damage. A new Quarry Visitor Center is slated for completion this fall. 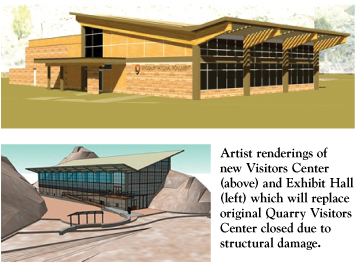 Its opening will coincide with the reopening of a new exhibit hall showcasing and protecting some 1,500 dinosaur fossils in the wall of the original visitor center, which first opened in 1958. The much-needed construction of the two facilities was begun in March 2010. —–In the meantime, river runners and others visiting the area have some options for touching base with dinosaurs. This spring the National Park Service plans to resume shuttle transport to a half-mile Fossil Discovery Trail where excavated bones are embedded in rock. The trail will only be open through shuttle transport from a Temporary Dinosaur Visitor Center located four miles north of Jensen, Utah, on State Route 149. For more information on how to tie your river running trip or rafting journey into post-or pre-exploration of the surrounding terrain and its prehistoric residents, visit this website. —–The quarry of exposed dinosaur bones from the Jurassic age at Dinosaur National Monument is one of the most spectacular paleontology exhibits to visit in the U.S., if not the world. The treasure-trove of bones from familiar dinosaurs like Brontosaurus, plant-eating Stegosaurus and so many more were discovered in August 1909 by the paleontologist Earl Douglass, who then worked to uncover them over a period of fifteen years. Many of the specimens and several nearly complete dinosaur skeletons he and his team excavated still may be seen at Carnegie Museum in Pennsylvania, which supported the excavation. The site has been a National Monument since 1915. Denver – December 23, 2010 On December 23, 2010, U.S. Secretary of the Interior Ken Salazar and Bob Abbey, Director of the Bureau of Land Management, announced an order which directs the BLM to designate appropriate areas with wilderness characteristics under its jurisdiction as “Wild Lands” and to manage them to protect their wilderness values. The BLM has not had a comprehensive wilderness policy since 2003, when the wilderness management guidance procedure in their handbook was revoked as part of an out-of-court settlement between the then Secretary of the Interior Gale Norton, former Utah Governor Mike Leavitt, and other interested parties. —–Abbey said that the “Wild Lands” will be designated through a public process and will be managed to protect wilderness characteristics unless or until the time when a new public planning process modifies the designation. Because the “Wild Lands” designation can be modified later through public participation, it differs from two other land usage designations managed by the BLM, that of “Wilderness Areas” selected solely by Congress and not subject to change except by legislation, and “Wilderness Study Areas” managed by BLM until Congress decides whether to permanently protect them as Wilderness Areas or modify their management. —–Although welcomed by the pro-wilderness preservation community, the “Wild Lands” order is opposed vigorously by others, including public officials in the Uintah Basin, widely regarded as an area of “energy-rich” lands that are a source of jobs and revenue for many local residents. —–To learn more about this important change and additional links, go to this BLM’s press release. 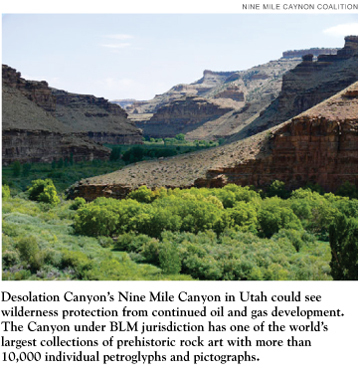 —–For more information about Nine Mile Canyon visit Nine Mile Canyon Coalition and the Sacred Land’s Nine Mile Canyon. A short video about oil and gas development in the Canyon can be seen here. In December the City Council of Flagstaff, Arizona, joined five Arizona Indian tribes to oppose uranium mining near Grand Canyon National Park by voting to support a 20-year moratorium on new mines proposed by U.S. Interior Secretary Ken Salazar. The vote was encouraged by Arizona Wildlife Federation president Tom Mackin who spoke to the council about the many additional ill effects brought to wilderness areas by mining companies. 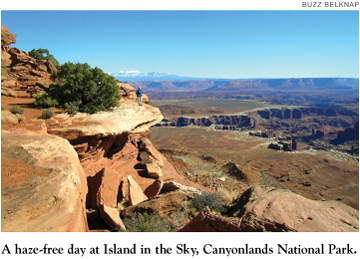 He noted that uranium mining claims near the Grand Canyon are proliferating, up from about 10 in 2003 to thousands today, with most of the newer ones filed by international companies. 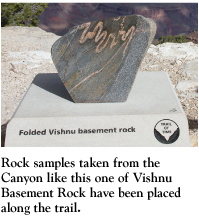 —–The Grand Canyon Trust reports that radioactive residues from our nation’s nuclear policies have been accumulating in and around Grand Canyon for more than five decades. To find out what you can do to help offset this growing threat, check out the extensive information on uranium mining near the Canyon on the Trust’s website. Glen Canyon Dam releases for the month of January are projected to peak at 16,000 cfs in late afternoons. Early morning lows will be 9,500 cfs. The average release for the month of January is projected to be 14,050 cfs or 845,000 acre-feet. —–Lake Powell’s reservoir level has continued to drop since July of last summer when it had reached a high of 3,637 feet or 64% of capacity. As of January 1, 2011, the lake elevation was 3,626 feet (60% capacity)—74 feet below the maximum elevation of 3,700 feet. On April 8, 2005,Lake Powell reached a low elevation of 3,555 feet (33% of capacity­—155 feet below maximum lake elevation). This year Lake Powell inflow projections for January and February are 84% of normal. 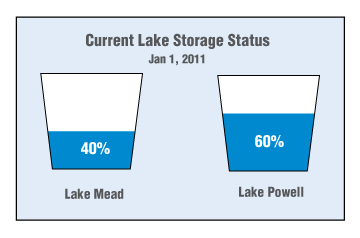 —–Lake Mead’s reservoir level as of January 1 was 1,086 feet, 40% of capacity, or 143 feet below maximum lake elevation of 1,229 feet. By this September Lake Mead’s water levels are projected to drop to within 1.5 feet of the level that would force cutbacks in water deliveries to Arizona and Nevada through a declaration of shortage!